I know I promised a tutorial for this owl , but I decided to try to make it better. If you are interested in the pattern for the other owl, let me know. I can put the pattern pieces on scribd.com. Now let's talk about Hootie. 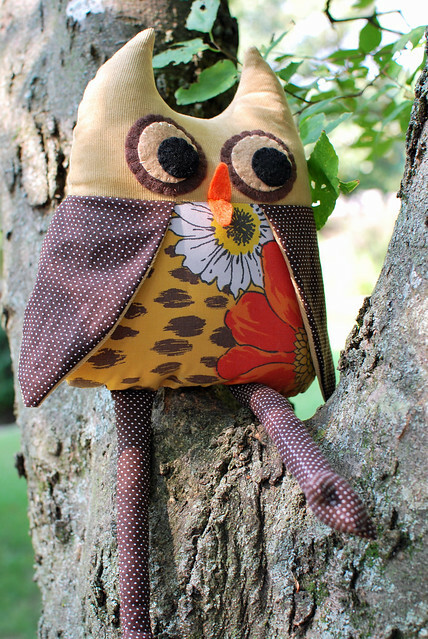 Hootie is made from some vintage sheet scraps I had, some corduroy, and more fabric scraps for the wings and legs. 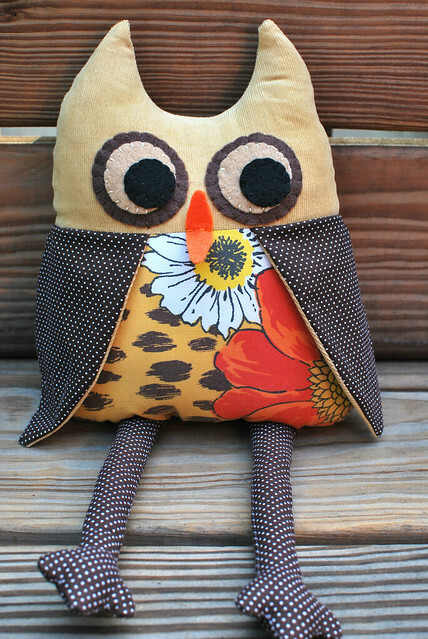 The pattern pieces are pretty small so it is a perfect way to use fabric scraps that you have around. 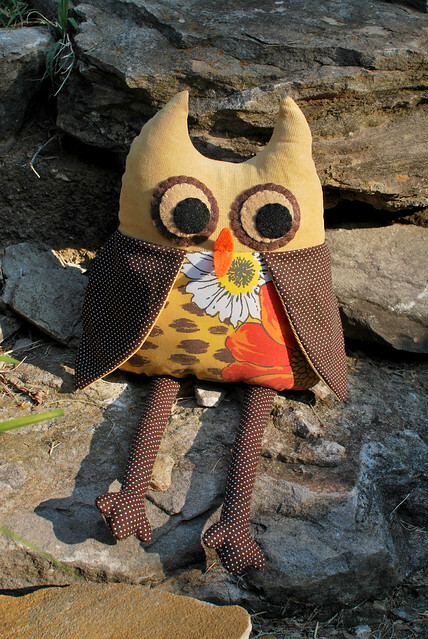 I used felt only for the eyes, since most people will not have owl safety eyes readily available to them. Since making one was not enough, I also made a girlier version using a sweater and a vintage pillowcase. I used chenille and satin scraps for the wings. The sweater material was definitely stretchier. I used a sweater that did not felt very well. So the head ended up larger, but it still works. Here they are enjoying each other's company. They are best of friends already. I am putting the finishing touches on the pattern and tutorial, but couldn't resist showing you the finished product. This is my 498th post and I wanted the tutorial to be my 500th post. So I am thinking that will be next Monday. It will be a photo tutorial. Then I will post the pattern pieces on scribd.com. they are beautiful! i think i might have found em's first animal project! she'll love it...we'll check back for the pattern & tute! Thank YOU!! 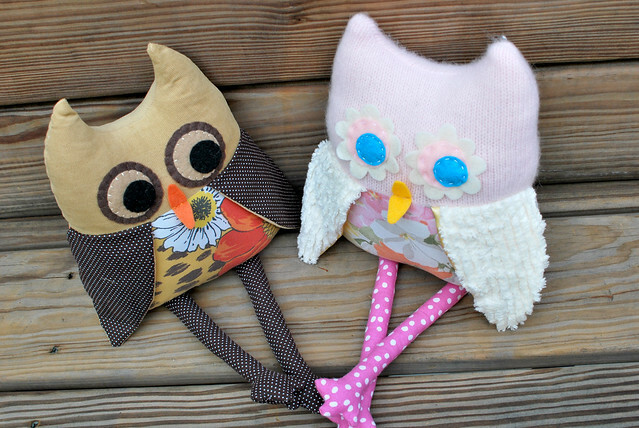 thanks for your comment on my blog :) your owls are adorable! 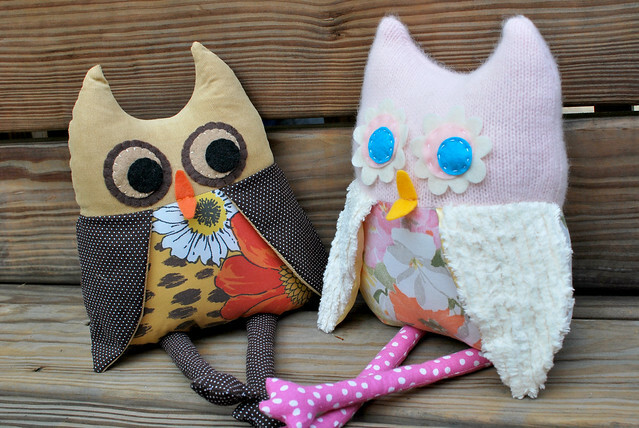 i have a friend who will LOVE these for her nursery - i'll direct her to your blog! Hey there! I saw an article about your felted wool coffee cozies in the GreenCraft magazine. So glad I did! you have such cute ideas. I've actually been making a lot of owls myself! Feel free to stop by if you have a chance. Hootie is a cutie! Think I will have to make one for my daughter. These are adorable and made me laugh. It looks like he's giving her that "look." I've always really liked your owls. Wishing my kids were still young enough to want one. oh golly, too cute! I love all the textures! 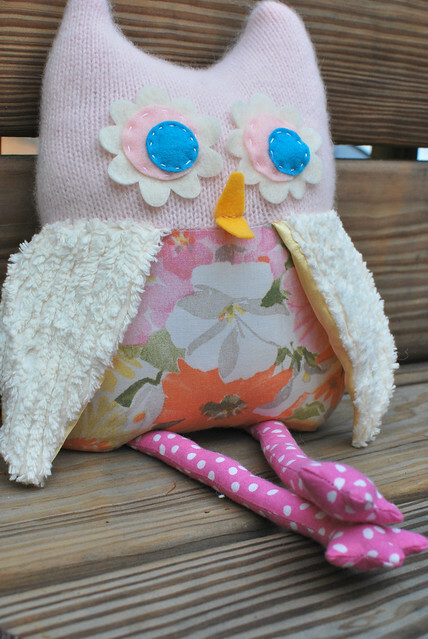 I love the pink owl so much!